And while music is seemingly everywhere, most of it falls within a narrow spectrum between trova ballads and reggaeton. Cuba in the ’60s and early ’70s, says Guille Vilar, a trained musicologist, ‘was a very serious place.’ Indeed many Cubans still recall having to sneak a listen to whatever Beatles album they could find in the wake of the Cuban missile crisis and the American trade embargo. “This place, it’s different,” said Alexander Peña, a student from outside Havana, sitting by the bar with three of his friends. Nonetheless, it is still quite Cuban. The Culture Ministry owns and operates the club, which opened in March. That means a cheap cover charge US$ 2.50, Beatles imagery without official licensing and waiters in the usual black vests, with the usual requirement of at least three reminders before any drinks are actually delivered. Mr. Vilar, who was an adviser on the project, said the government was trying to do the right thing to reopen closed spaces and broaden Havana’s nightlife. On a recent occasion, two groups seemed to be represented, the baby boomers wearing dresses and slacks and twenty something hipsters in jeans and tight t-shirts. The hair and accents were wrong, but the audience cared about just one thing; the house band was singing the Beatles, here, in a new bar called the Yellow Submarine, in Cuba, where such an act might have led to arrests in the mid-1960s. Maybe so, but Cuba’s revolutionaries were not sure what to make of it when it first came out. Though today the bonds between counter culture rock and leftist politics are well established. Better yet, perhaps because of that history, the band played like rebels. Fast and raw, they raced through ‘Rocky Raccoon,’ and when they reached the opening words of ‘Let It Be,’ “When I find myself in times of trouble,” the entire crowd began singing along with their eyes closed in rapture. Back then, Cuban authorities, at least some of them, saw anything in English as American and practically treasonous. 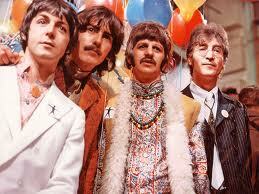 The Beatles, along with long hair, bell bottom jeans and homosexuality, were all seen as cause for alarm or arrest. For the young, however, the Yellow Submarine offered the opposite, something new. For a few the bar’s existence even suggested the island’s old government was learning some new tricks. “Maybe it shows that things in Cuba are changing,” Mr. Peña said.